This trip requires a minimum of 9 participants! The program below is a proposal and details may change due to permission requirements from the tourist police and military. Permission must be sought at least six weeks in advance. Departure from Cairo in the morning to arrive at Golden Valley Hotel in the Bahariya Oasis, just in time for lunch. After lunch we take a tour of the oasis to see the environment and end the day at the English Mountain to watch the sun go down over the oasis. After dinner, we enjoy Bedouin music and tea around the fire in the camp next to the hotel. After breakfast we visit the museum and monuments of the oasis that takes us back to the Greco-Roman and Pharaonic period. We pack the cars and then start our journey through the Black Desert, Beduin village El Haez, Crystal Mountain and El Agabat. Then on to new and old white desert of the White Desert National Park, where we will camp and eat dinner before we go to sleep under the stars. We leave the new white desert in the morning to go to Abo Minqars dunes where we have lunch. We continue to the Dakhla oasis for a tour and overnight stay at a hotel in Dakhla. 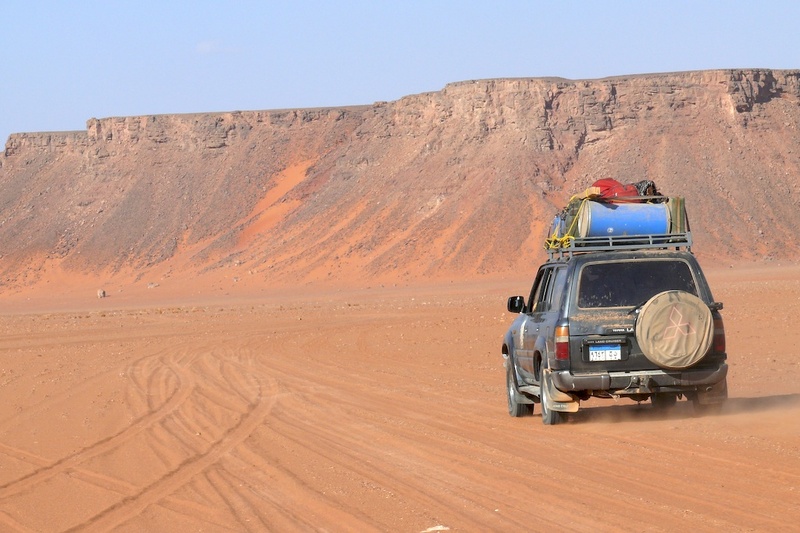 From Dakhla we leave the road and drive into the desert for the first 10-12 days off-road. We arrive at Abo Balace in the evening to camp and sleep. We continue from Abo Balace to Thaman Akrace (Eight Bells) where we camp. We drive from Thaman Akrace to Karkur Talh at the Unweinat Mountain to spend the rest of the day there and explore the caves with their remarkable paintings. Arrive to Wadi Sura (Valley of Pictures) where we will visit the Fuggini Cave and the Cave of Swimmers whose rock paintings are known from the movie " The English Patient "and spend the night in a camp there. From Wadi Sura we drive up the Aqaba Pass to find the next campsite. A short drive that will give us time to explore the caves and the surroundings. We drive from Aqaba to Wadi Hamara (Red Valley) for more petroglyphs and hopefully find some green plants and trees, and maybe even some animals. To the "Selekta" area at the beginning of the great sand sea to look for Selekta glass that was formed about 30 million years ago when a meteor struck. In this area you can also find artifacts like arrowheads, knives and other tools made from flint. The camp is set at the foot of a sand dune. Into the great sand sea, and over it all the way to Siwa Oasis. It will take us 2-3 days to reach Siwa and Bir Wahed (Spring number one) south of Siwa, where we can take a dip in the warm water. From Siwa we need 1-2 days to return to Cairo via the Mediterranean coast, or drive back to the Bahariya Oasis in the desert and continue to Cairo from there.